I am always trying different hosts for my hosting reviews. And every now and then, I get the idea to change the hosting of my main domains as well. For a few months now, I was seeing reviews of WPX hosting everywhere, and almost all reviews were positive. I had to try this host for myself. This time, I thought why not move maherhackers.com to WPX? This is my review of my experience with WPX hosting and what I think about it now that I have transferred MaherHackers to WPX Hosting. Use coupon code “MaherHackers” to get instant 50% OFF your first month on any WPX monthly plan. Valid only if you visit WPX through our link. What made me move over to WPX Hosting? Exclusive control panel… good or bad? I run many websites and use different hosts for different needs and sometimes it becomes a clutter when I just host more sites on a server than it should have. I am using Inmotion VPS for some of my sites and this site was hosted there as well. But for some time now, it was giving me issues on Inmotion hosting and it was just too much. Inmotion is having some issues every now and then and uptime was well below 98%! Even for a page with 620kb size, it is loading in more than 6 seconds. That’s not good. So I wasn’t happy with it. As you can see… Huge improvement. End goal achieved. I am using Marketers Delight WordPress theme which is very lightweight, so that helps a bit with loading times too. WPX Support also installed and configured W3 Total Cache plugin on my site as well which got me A in Google PageSpeed Score as you can see in the above image. But that’s not all! Let’s look at more details of WPX Hosting and why it is better than other hosts. We have already discussed how my website’s speed increased after switching to WPX Hosting in the above section. But besides website loading speed, Time to First Byte (TTFB) is an important factor to determine your server’s speed. TTFB means how long it takes your browser to receive the first response from your server. The faster it is, better your server. Any website should have TTFB of 500 ms or below. If it’s higher than that, you should change your host right away. I also ran the site through Bitcatcha and as you can see the Server Response Time is exceptional. 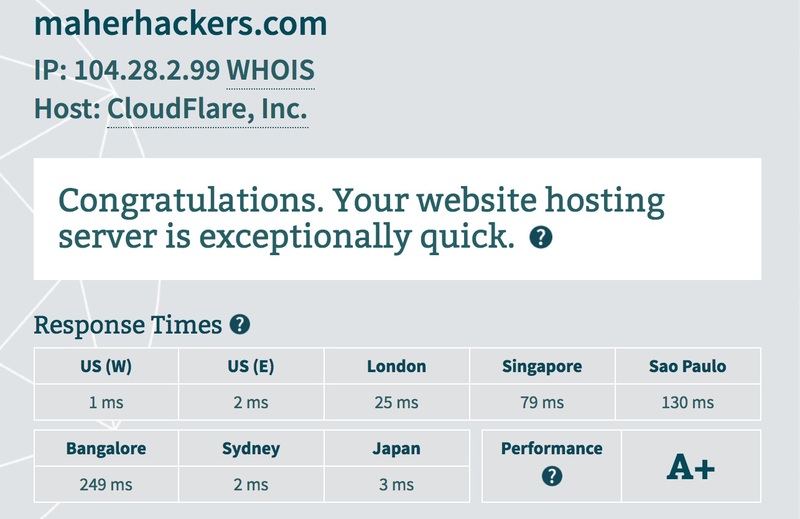 Even the best-rated sites have the response time of around 30-50 ms, but I got 1-2 ms for the US! That’s unbelievable. Note: I’m also using CloudFlare CDN on this site as well. Unlike all the other hosts on the web, WPX Hosting doesn’t use the standard cPanel. Instead, they have their own custom Control Panel to make changes to the account and websites. They have created their own dashboard after realizing that many users have a hard time navigating Cpanel and it also slows down the server’s performance. The good thing about it is that new users who have never used hosting before will find it easy to navigate and make changes on their websites. Though someone who has experience with hosting may find it different than what they are used to, after a day of browsing it, you’ll get the hang of it and will find actually easy to use. WPX Hosting offers you a tailored dashboard instead of an outdated one. The user-friendliness, 1-click WordPress installation, and backups make WPX’s dashboard pretty useful for all users. WPX Hosting is NOT your standard shared hosting plan with cheap pricing and lots of upsells. WPX Hosting is a premium managed WordPress hosting. You can host your WordPress sites on WPX Hosting very easily and run them every day. And if you run into any issues with your site, you can just connect with WordPress support via chat and get it fixed in seconds, more about the support in the next section. If you already own a website and want to move to WPX Hosting from your old hosting provider, WPX makes it easy by providing Free Migration. Other hosts like Bluehost charges $149 for one website transfer! So WPX Hosting providing premium migration service for free is admirable. You can put a migration request by filling all the required details and they will move over your site to your new hosting server in less than 24 hours. Not only that, WPX Hosting team will also scan it for any malware and clean it if needed when migrating. SSL is important. Everyone is moving to https and every host out there is providing free SSL these days. WPX Hosting also configures your SSL and installs your SSL certificate the right way, which is very important. To enable SSL on any of your sites, Just contact them and they will do the needful. They will also make sure all links to your website redirects to https, so you don’t have to worry about anything at all. You can also enable and configure SSL certificate on any of your sites yourself very easily. This is one of the important and handy features to have. With WPX’s WordPress Staging Area, You can test changes to your WordPress site without actually making any changes to your live site. You can create staging areas for your domains and make changes however you like without worrying about anything going wrong because your live site remains unchanged. After you have made changes that you want to see on the live site, You can easily merge the staging version with the live site. While most of the other shared hosting providers offer limited support for email and hard to configure email service, WPX Hosting provides incredible email support which you can manage easily from the control panel. You can create new email addresses of your website or change settings of email address from the dashboard without a hitch. 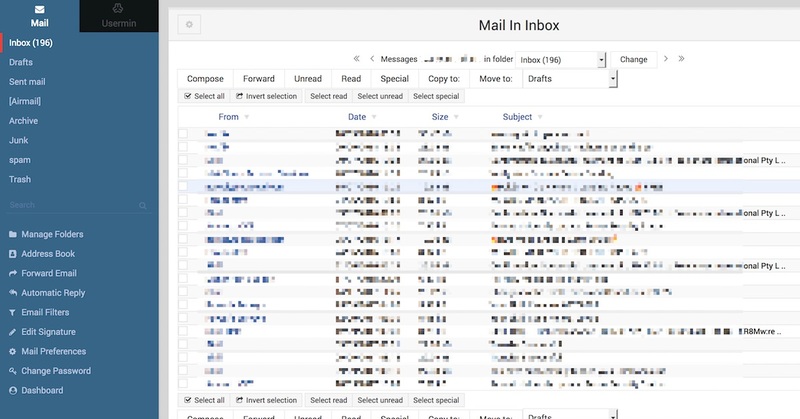 WPX Hosting also provides custom email client you can open anytime on your web browser to access your email. Backups are important and you never know what might go wrong with your site. WPX Hosting automatically backups your website every day and each backup is kept for 28 days. So you can quickly revert to any past backup from your control panel yourself if needed. Not every web hosting company provide a free daily backup feature because it is a time-consuming and resource-heavy process. See how easy it is? That’s the thing I like about WPX Hosting, The control panel is really useful and helps you get things done the way you want them. Many hosts charge an expensive fee for their support if you choose their daily data backup service. Why waste time and money when WPX Hosting is providing free daily backups? This is a huge plus point of WPX Hosting. This kind of DDoS protection would cost you hundreds of dollars per month normally. And you won’t get it on most cheap hosts, even as an option. WPX provides it completely Free. In the world of the digital age, hacking attempts are pretty common. And DDoS attacks happen to most of the sites, every once in a while. If your website gets hit with DDoS attack, you will face many issues including website downtime, thousands of spammy emails, server issues even after the website recovers and what not. It would take days for your website to recover. But with WPX Hosting, you can rest assured that will not happen. Most, if not all hosting providers promise 99.99% uptime but not all live up to it. I have tried most of all hosting providers and uptime is never what you expect it to be. Your websites will go offline frequently, especially on the shared hosting plans of popular hosting providers. If your website is going offline frequently or giving issues every few days, you will lose your visitors. And if the traffic has come from Google, if the user returns to Google if your website doesn’t load, it’ll also impact your rankings on Google, negatively. I’ve been with WPX Hosting for months and none of my websites have experienced any downtime as of yet. While some of my websites hosted on Inmotion VPS do experience downtimes once in a while. WPX Hosting has recently started offering their own CDN service, WPX Cloud, to all their customers, for free! You can easily enable your free WPX CDN from your control panel for any of your WPX hosted websites. What WPX Cloud does is it instantly improves your websites loading speed without paying hefty fees to third-party CDN services. WPX Cloud is especially useful if your website serves a global audience. While fees for other CDN services like StackPath (Formerly MaxCDN) and CloudFlare premium starts anywhere from $10-$20, WPX Cloud is completely free for all WPX Hosting plans. Now that we have talked about WPX Hosting features and why I like and recommend the hosting, Let’s talk about what WPX Hosting is and hosting plans they provide. Not many understand the value of good hosting support system these days due to the clutter that is hosting industry today. But it matters, A LOT. You may run into issues from time to time and no matter how tech-savvy you are, you might not be able to resolve all of them yourself. WPX Hosting provides excellent support, especially for WordPress. Seriously, you never had this knowledgeable WordPress support before, trust me. No matter what issue you’re having, WPX Hosting support will help you resolve it right away, no need to wait for hours on your ticket. You can chat with them and get your issue resolved in seconds. Even if it’s a theme issue, plugin issue or coding issue, they are always there. WPX Hosting is rated one of the most trusted hosting providers on TrustPilot. Besides that, you can find thousands of positive reviews of WPX on Twitter and Facebook. When other web hosting companies take days to provide the solution, WPX hosting is taking only a few seconds. Just like many of us, Terry Kyle, the founder of WPX Hosting, was a web entrepreneur who got tired of the hosting services provided by some of the popular hosts. They would boast of unlimited bandwidth and unlimited storage and so on but it was just on paper. The horrible hosting services by well-known hosts made Terry start a hosting company that actually provides value to users. WPX Hosting was launched in 2013, with three main objectives: Speed, Support, and Simplicity. WPX Hosting doesn’t offer normal hosting plans including shared, VPS, dedicated, etc. like other hosting providers. Instead, WPX offers WordPress hosting plans, so you can host your WordPress blogs without the worry of bandwidth, storage, speed, uptime and what not. Though you can host non-wp websites on WPX as well, as discussed before. WPX Hosting is suitable for anyone who wants to host a WordPress site without worry of constant issues and slow loading times. WPX Hosting has 3 different plans for different needs: Business, Professional, and Elite. The WPX Hosting Business plan is perfect for serious bloggers and businesses that need limited space and limited bandwidth to operate online. This package is designed especially for the beginners. If you are one, you can choose this plan and then switch to a higher one if needed. The Business Plan allows you to install up to five different WordPress sites or domains. You get 10 GB of SSD storage and 100 GB of bandwidth for the whole month. This much bandwidth would be sufficient to run blogs or sites without experiencing any sort of technical problem. Even if your website is getting more than 1000 visits a day, this plan will suffice. The WPX Hosting Professional Plan is the most popularly chosen plan by the customers. You can host up to fifteen different websites with this plan. 20 GB storage limit for each month is pretty enough to store a lot of data on the servers. 200 GB bandwidth offered with this plan is simply impressive because that’s how you can gain access to more resources. The cost of this plan is almost double what the Business plan costs, but the amount of resources, storage, and bandwidth is also increased. You will not waste your money if you choose this plan because your website’s performance will improve and eventually you will gain more profit. It is the most expensive plan on WPX Hosting and if you don’t run multiple high traffic websites, It is not needed. WPX Hosting provides everything with this package. If your plan is to host many WordPress websites and run them smoothly, you should select this particular plan. You can host up to thirty-five different WordPress blogs or websites with this plan. Though you can host several websites, there will not be any technical issue to affect the performance of all 35 hosted websites. You will get 40 GB of storage along with unlimited bandwidth. It will help you in serving your customers without any issue, even if millions of users access your website every month. There are a lot of web hosting providers out there. Hosting providers like Bluehost, SiteGround, HostGator, A2 Hosting, MDDHosting, Hawk Host, StableHost provides hosting solutions just under 5 dollars. Or so they say. You see, the thing is, those hosting providers advertise very low prices, but those prices are valid for first purchase only. You have to pay pretty hefty fees for renewals. But that is not all. Most of these hosting providers spend millions of dollars on marketing and their end goal is to acquire a customer, not to provide quality hosting solutions. They advertise unlimited storage and bandwidth and what not, but they are not unlimited by any means, and rather very limited in real. When looking for a web hosting provider, it’s very common to fall into their advertising tactics and regret the decision later. So you should never actually signup for these hosting providers if you intend to use it for professional means and not just for fun. Then there are other, more expensive hosting options too, Like WP Engine, Kinsta, etc. but we found them to be too overrated and expensive and WPX does the job well and suits the budget. Note: It is important to note that shared hostings provided by Bluehost and SiteGround are nowhere near what WPX provides. We are comparing just so you get the idea. For a true comparison, WPX services can be compared to VPS or Dedicated services of some of the host. For more thorough comparisons, Check out our comparisons of SiteGround Vs WPX Hosting and Bluehost Vs WPX Hosting. Can you host non-WordPress sites with WPX Hosting? WPX Hosting is managed WordPress hosting and they provide easy access to WordPress, but that doesn’t mean you can’t host non-WordPress websites with WPX. After signing up for WPX Hosting, you can see your FTP details in the Dashboard, which you can use to connect to your server and upload your files. So it’s not just for WordPress, though they advertise it as a WordPress, because most users these days are using WordPress and it’s easy for the new customers to understand and get started. Why is WPX Hosting better than the competition? WPX Hosting is definitely better than the competition because they really care about providing quality hosting services. If I want to move from another host to WPX, how do I do that? WPX Hosting provides Free migration on not one, but any number of sites from your old host to them. Not only that, the good thing is that they will transfer your website to WPX from your old host within 24 hours of requesting. All your website files, databased will be transferred to your new host. You can request as many migrations as you want by filling a from. So you actually don’t have to do anything besides filling a form with your website details. Does WPX renewal prices are higher than signup prices, like other hosts? Not at all. 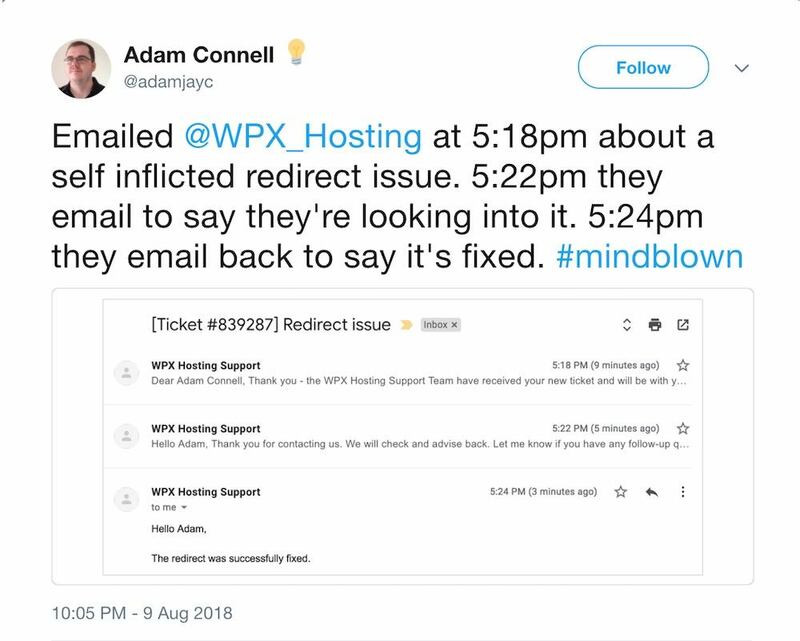 I actually admire WPX for providing transparent services while most of the hosts use these tactics to fool and acquire customers. But WPX shows you prices in a clear manner so you don’t have to pay hefty renewal fees. All prices are same for renewal as well. What if I don’t like WPX after signing up? I don’t think that’s gonna be the case, but if for some reason you don’t like WPX Hosting, you can ask for your money back under 30 days. All WPX plans come under 30 days money back guarantee. Will my website loading speed improve after moving to WPX? Without a doubt, you will see a huge improvement in your website’s loading speed after moving to WPX Hosting. I experienced it myself. My website went from loading in 6 seconds to loading under 1.5 seconds. So I’m pretty confident you’ll see faster loading times on WPX Hosting and it’ll help your business tremendously. WPX Hosting is, no doubt, pricier than other shared hosting services offered on the web. But there is a HUGE difference of value. If you go with any cheap shared hosting service, you will have constant issues and in the end, you won’t get your desired result from your site, which is to make it profitable. WPX Hosting is for all those who need a real professional hosting service for their site which doesn’t just care about money but providing incredible services to their customers. WPX Hosting is one of the fastest growing web hosting companies right now and is being used by many successful bloggers and brands. If you choose WPX Hosting, you will prevent yourself from making hosting mistakes that people make when choosing low-quality hosting. So whether you’re someone looking to purchase hosting for the first time or someone who want to change their host, WPX Hosting will fulfill your NEEDS! Have something to say about WPX Hosting? Comment below! Previous Post: Blogging For Money – Everything You Need to Know! Next Post: Does Advertising Really Make Money for Your Blog? This is my personal experience with WPX Hosting and I found it to be the best hosting service of 2019. Use Coupon code MaherHackers to get instant 50% OFF discount the first month, on all monthly Plans. Coupon is only valid if you visit WPX through our link.